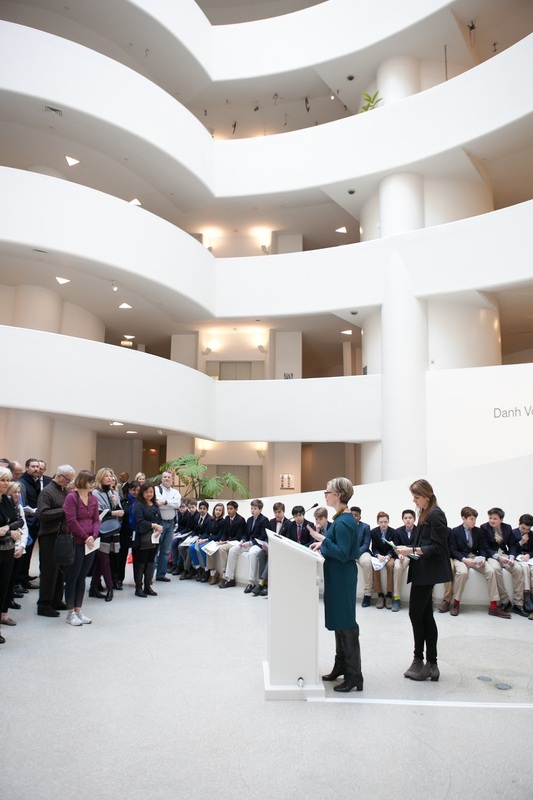 Seventh graders presented "Learning to See through Art: Foundations of Observational Drawing" at the Guggenheim yesterday. The show was the culmination of Saint David's special partnership with the Guggenheim Museum. 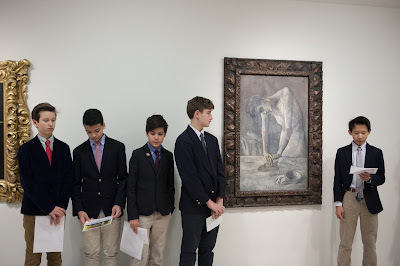 During the winter, the seventh graders' art sessions were conducted at the Guggenheim, where they studied modern masterpieces from the Thannhauser Collection and developed observational drawing techniques under the guidance of teachers Ms. Boccella and Ms. Mendez. Yesterday, the boys first led tours of the gallery, where they discussed the works from Brancusi, Monet, Kandinsky, Picasso, Cezanne, or Gaugin that they had selected to draw, and what had inspired them. 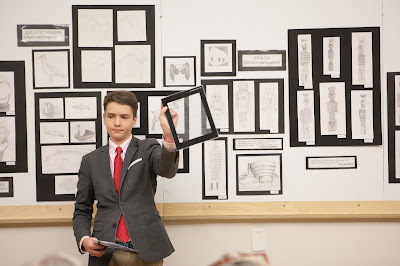 They then led participants to an exhibit of their own observational drawings, on display in the Guggenheim art studios, where they shared the techniques of contour, angles and proportions, value and texture, negative space, and gestalt that they used. 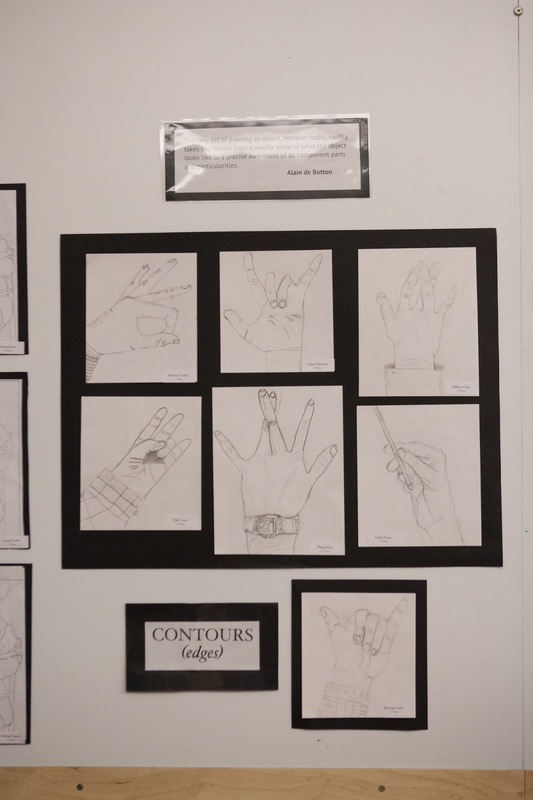 In this unit, observational drawing is demystified as the boys learn to master its skills and techniques. They also discover the importance of focus, concentration, effort and practice. The exhibit affirmed the inherent value of stopping to look closely, take time, and go deep. 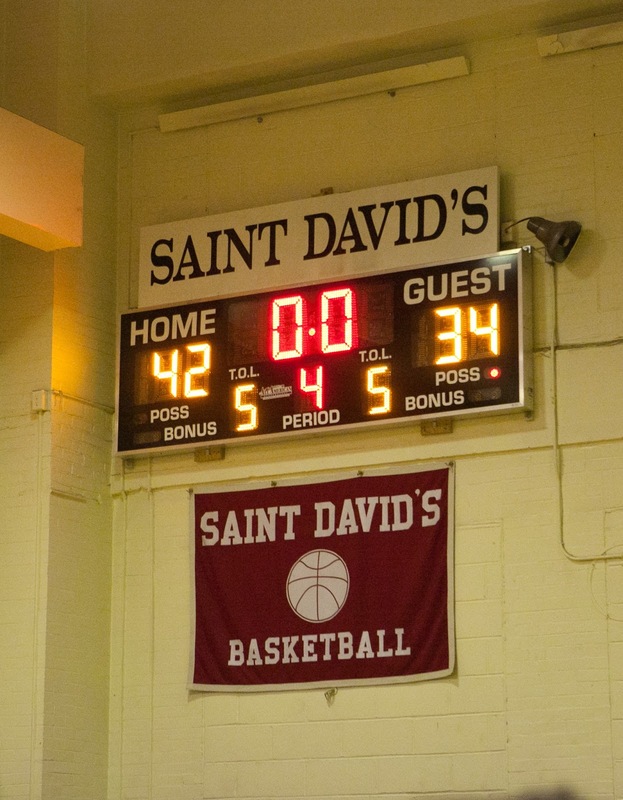 42-Home, 34-Guest--the final score of the final game that our boys will ever play at our 94th Street Campus, the site of Saint David's home games since 1995. Yesterday's White and Red basketball games against Allen-Stevenson ended spectacularly, with two wins and enthusiastic energy among the players and spectators alike. 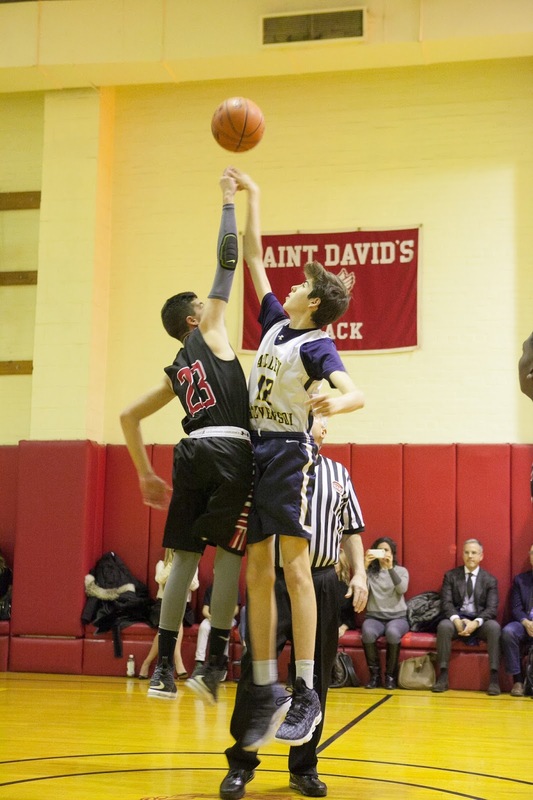 It was a fitting end to an era on 94th Street, as we look ahead to the three new gymnasiums that will be on-site at 89th Street come September: our new Lower, Middle, and regulation-size Upper Gyms will enable us to take our sports program to the next level. Fourth grader Brody C. was named a winner of the New York Rangers Junior Rangers Mask Design contest. 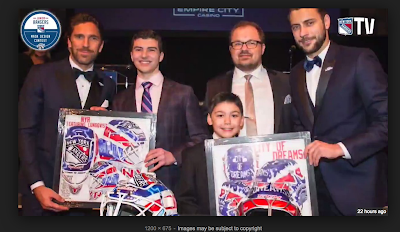 Brody used his creativity and design skills to do good: The masks are being auctioned, with all proceeds going to the Garden of Dreams Foundation, a non-profit that works with Madison Square Garden and MSG Networks Inc, to support children who face a variety of challenges. Well done, Brody! 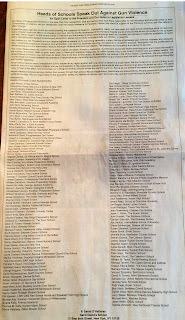 We are all proud of you! 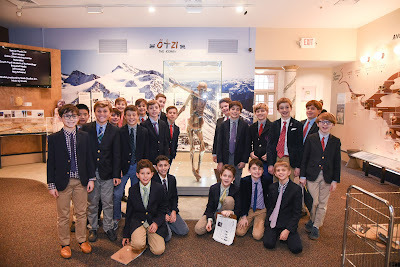 Prior to school this morning, Peter Flexner '08 gave a special Chapel Talk to our fifth graders and their mothers about his relationship with his mother and the vital role she has played in his life. 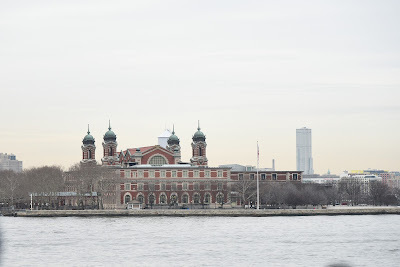 Peter, a graduate of The Hotchkiss School and Colgate University, spoke of how he lived far from his mom during both high school and college, but that he now is a mere five blocks away. 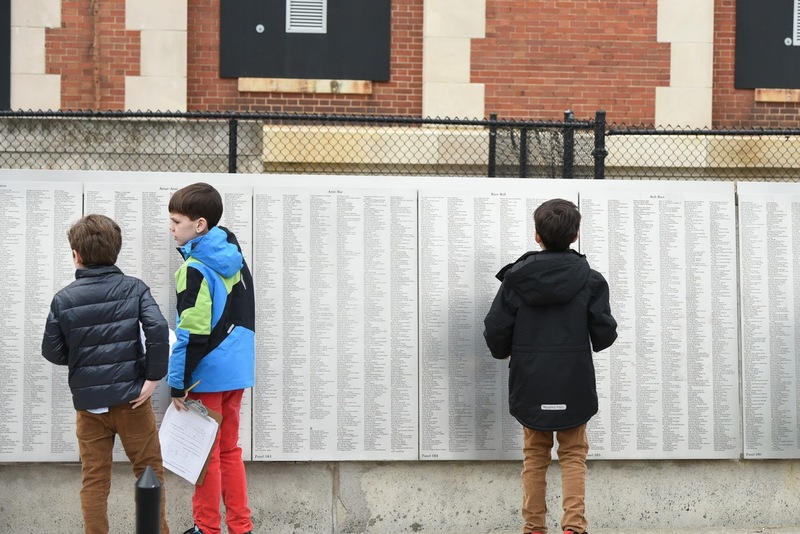 He credited his mom's big heart with teaching him to live with empathy, a life lesson that helped him greatly when he was far from home; and he encouraged the boys present to retain close ties, "to always remember to call your mom." 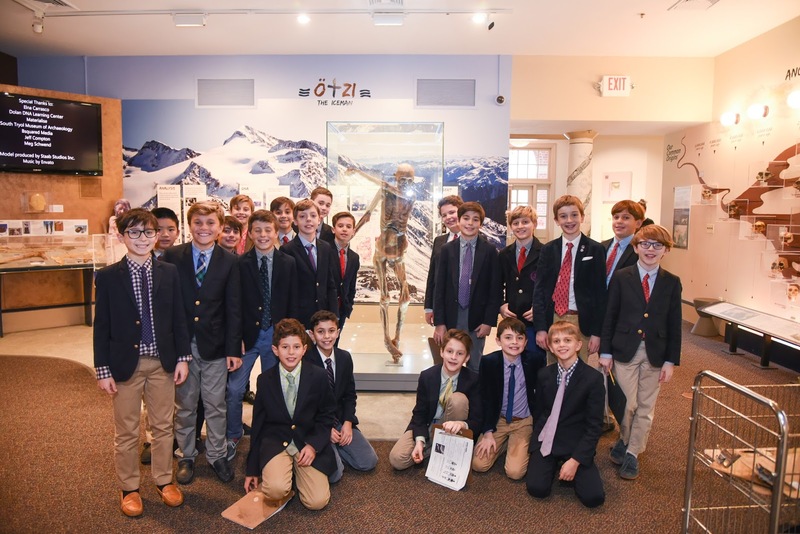 It was so good to welcome Peter and Deban, former PA President, back to the school for the Fifth Grade Mother-Son Chapel, a singular tradition that marks the special, enduring relationship between our boys and their mothers. Alan Murray, President of Fortune and Chief Content Officer of Time, Inc. recently visited Saint David's to speak with our eighth graders. Mr. Murray, who also served as President of the Pew Research Center and Deputy Managing Editor at the Wall Street Journal, is acclaimed for his high quality journalism and thoughtful use of digital media. Our boys enjoyed a stimulating talk that centered on journalism, research and critical thinking. Mr. Murray's visit was made possible by our Parents Association Author Series, which brings published authors to the school to speak with our boys about writing. 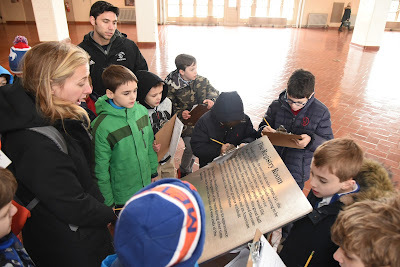 Our third graders are studying immigration to the United States at the turn of the 20th century. 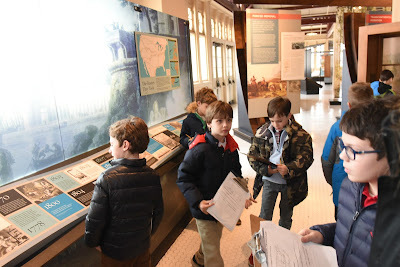 The boys are investigating the reasons why people left their homeland for America and are considering the many challenges that they faced. 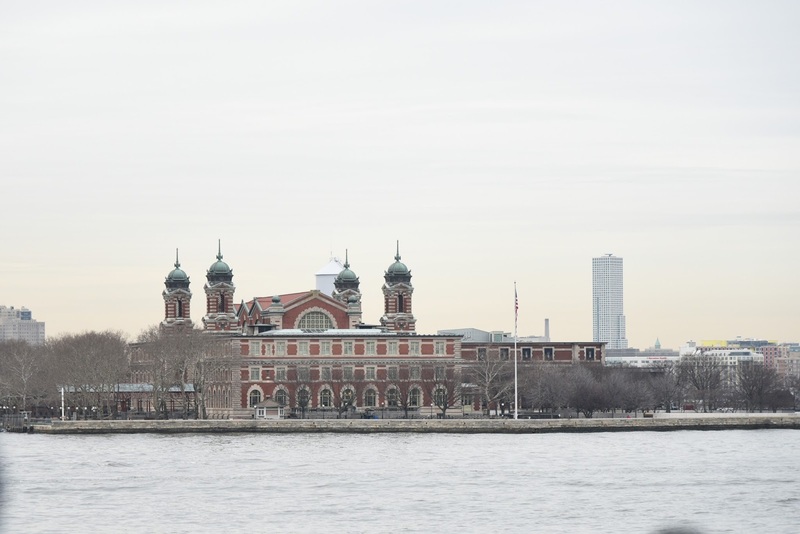 Last week, the class spent the day with their teachers at Ellis Island, entry point for more than 12 million immigrants from 1892 to 1954. 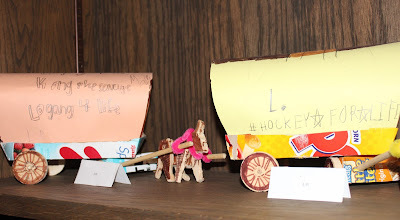 There, the boys explored artifacts and primary sources. Some perused the Wall of Honor, looking for the names of their own ancestors who made it to America's shores via Ellis Island. 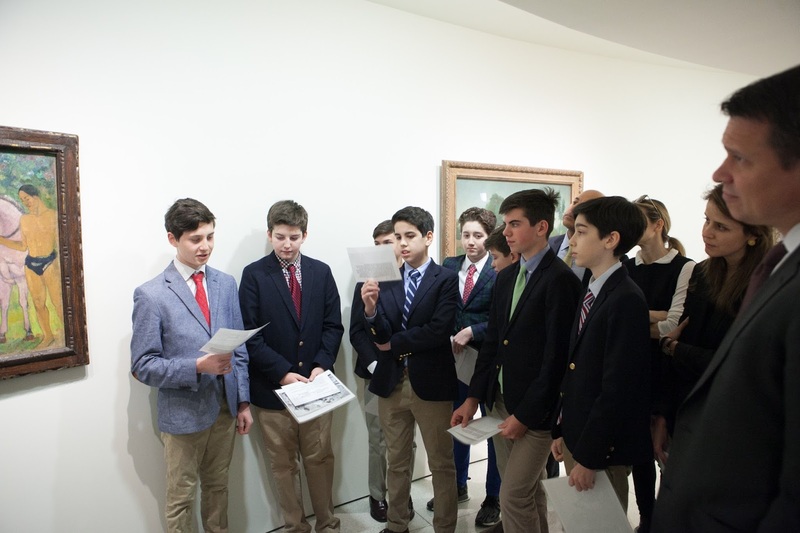 During their study of immigration, the boys also visit the Tenement Museum on the Lower East Side and participate in a Mock Ellis Island activity, in which they have to role play the experience of an immigrant and be interviewed by various processors. 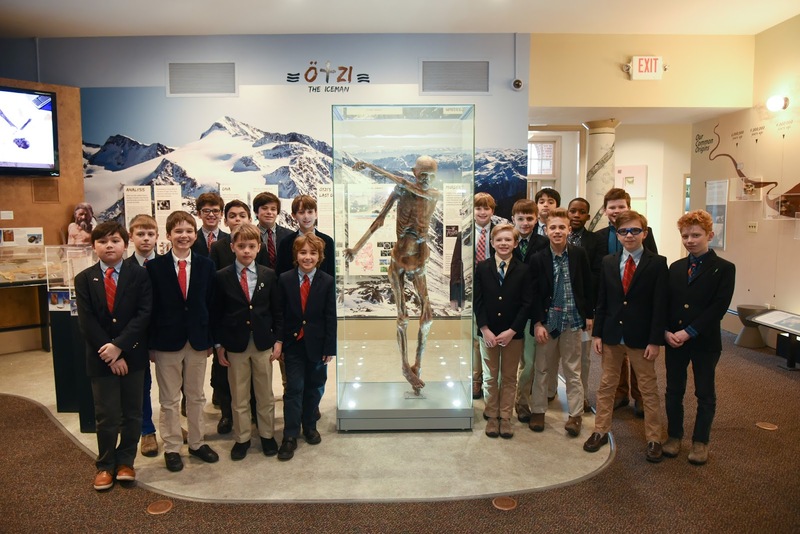 The breadth and depth of this unit enables our boys to step into the shoes of an immigrant, and to understand the immigrant experience from a variety of perspectives. This increases their respect for and appreciation of difference in its many manifestations. Our seventh graders recently put on plays related to their year-long, in-depth study of the ancient Greek and Roman civilizations. 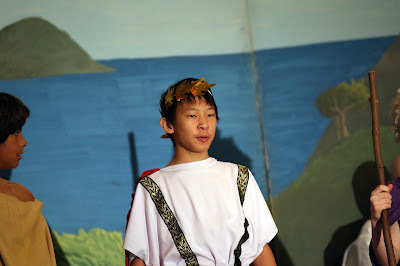 Seven Theta presented information about ancient Greek theater, as well as scenes from four plays: "Agamemnon" by Aeschylus, "Antigone" by Sophocles, "Medea" by Euripides, and "The Clouds" by Aristophanes. Seven Pi performed "Oedipus at Colonus" by Sophocles, part of the playwright's Oedipus Triology, which also includes "Oedipus the King" and "Antigone." 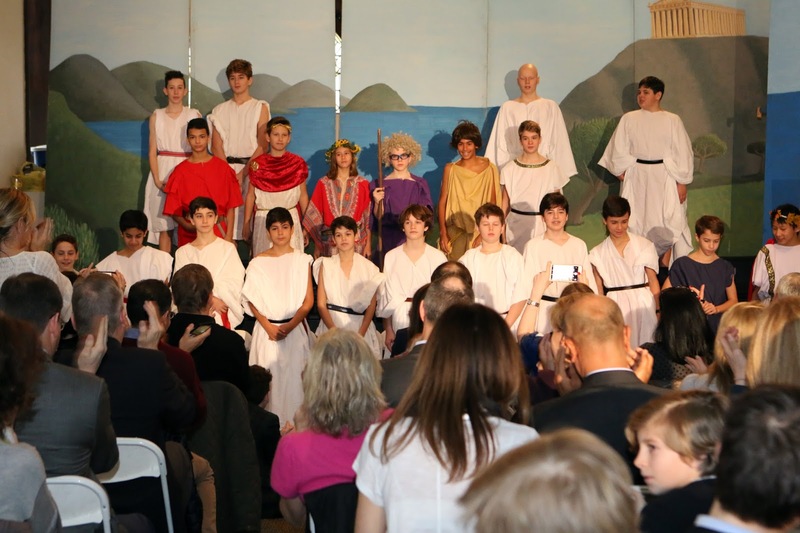 The Seventh Grade Play tradition enables our boys to explore universal and timeless themes that the ancient Greek playwrights tackled such as fate, power, morality, and human beings' relationships with the gods and with each other. 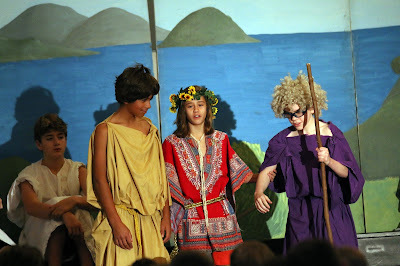 It is also an opportunity for our young thespians to indulge in some serious and comedic acting. Both performances were so well executed; congratulations to all of the boys and to their teachers, Mr. Barbieri and Mr. Kilkeary. 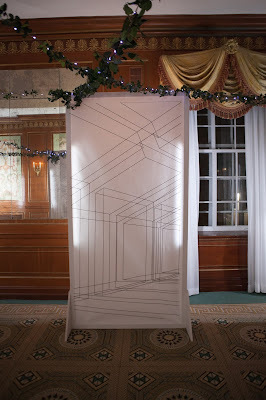 This year's performances took place in our temporary "auditorium" -- the Rochester Room at St. Thomas More. Next year, they will hail from the stage of our brand new Performing Arts Center. Yesterday, our second graders were treated to a performance by Second Grade dad and trumpeter Franco Finstad and his Brass Quintet. Mr. Finstad not only played the trumpet, but the conch shell, ram's horn, Egyptian trumpet, and the bugle. 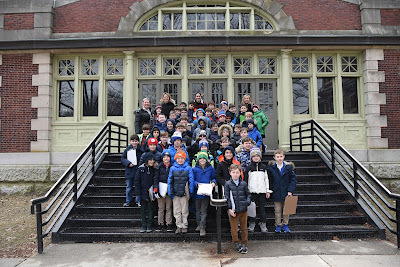 The boys also learned about trumpet mutes and heard a wonderful rendition of "It Don't Mean a Thing If It Ain't Got That Swing" as well as "Mo Better Blues." The final tune was a Canzone by the Italian classical composer Gabrielli. As our Music Chair Jeffrey Moore noted, "It was a wonderful introduction to brass instruments, as well as an entertaining musical performance made very special by our very own Mr. Finstad." Our appreciation to Mr. Finstad and his Brass Quintet for treating our boys to a most engaging music lesson. 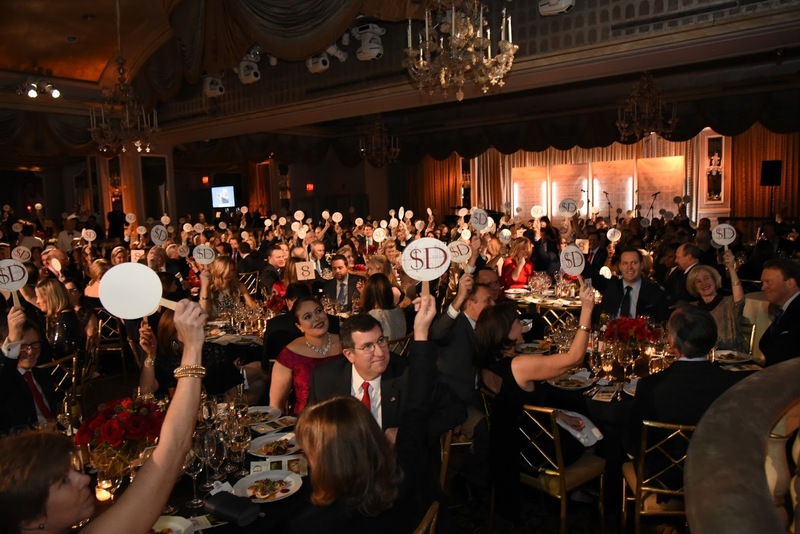 At Friday evening's PA Benefit at The Pierre, we celebrated not only the new foundations of our new building, but also the philosophical foundations upon which Saint David's is based. 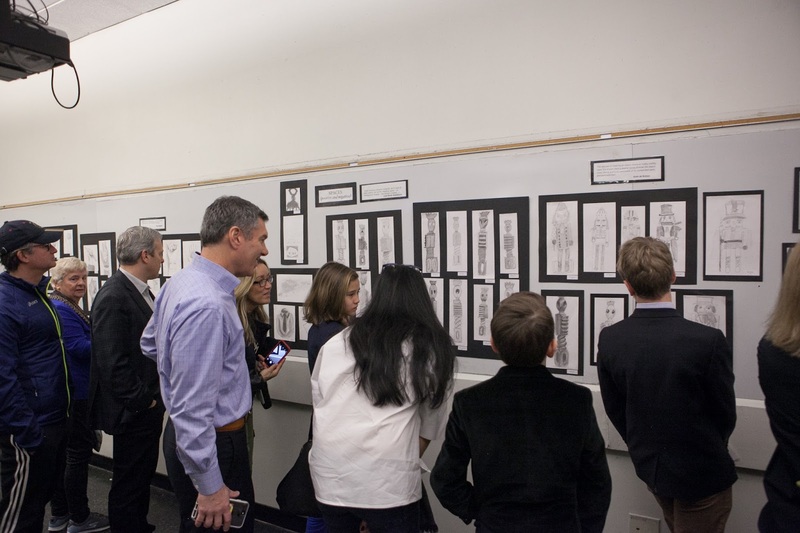 Everything was spot on: the Michelangelo-inspired design, the phenomenal auction items, the dinner and dancing, every detail perfectly rendered, in the perfect fashion of our parent community. Thanks to Benefit Chair Rita Kitt who employed her boundless creativity and exuberance in leading a most talented Benefit Committee Team and to our always inspiring PA President Linda MacKinnon. 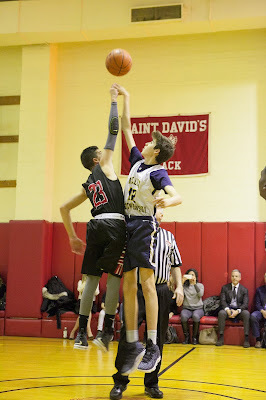 From the beginning, Saint David's boys have been guided to be all that they can be in academics, the arts, athletics, and spirituality. 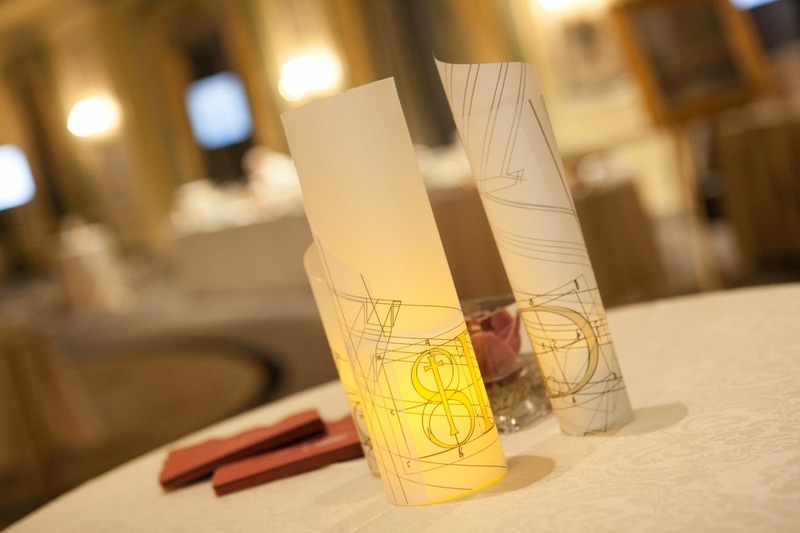 In each of these pillars, they are taught to seek "the good." 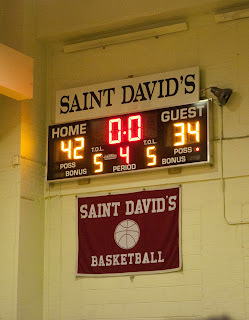 That is the reason why we are here and what we were celebrating on Friday. Come September our "new" school will allow our boys, their teachers, and our community to be all that we can be and all that we will be. 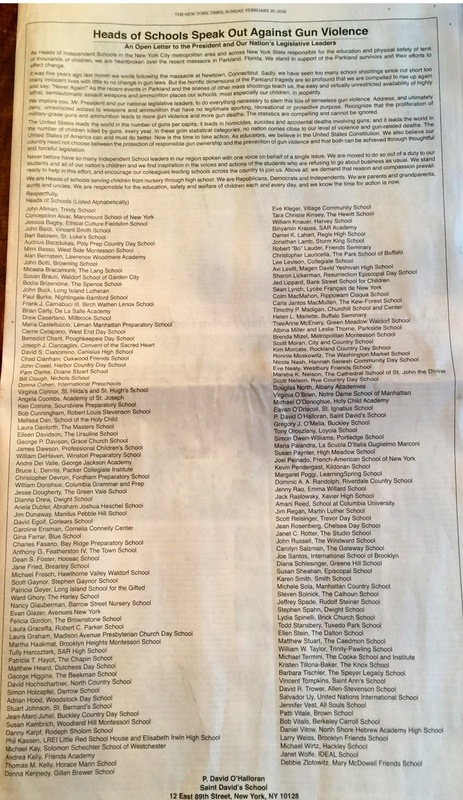 The foundations of this unique school have never been stronger. Below is the video, produced for the evening by Cyn Rossi, Ashley Gramins, and Renata Xatart, which speaks to how our exciting expansion is underpinned by Saint David's enduring philosophical foundations. 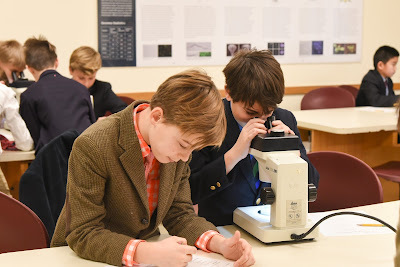 Our Founders' Dream, "Omnium Nobis"
This past Monday, February 5, was Founders Day at Saint David's, a Fete de L'Ecole that celebrates the ten founders who, by opening the doors of Saint David's School in February of 1951, turned a dream into a reality. 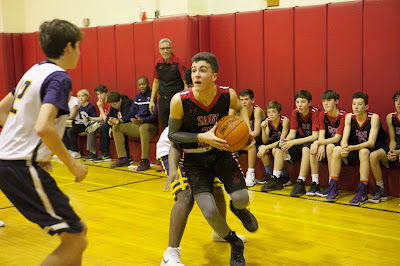 In Chapels that I gave to the boys in Grades Three through Eight in what will be the new Upper School Gymnasium come September, I discussed how our expansion into Graham House is fulfilling another of the founders' and former Headmaster David Hume's dreams for our school and her boys. In each Chapel, a boy read aloud the founders' names, allowing them to echo and ring through the new space, and we recognized that what we are doing now is only possible because of the vision of those bold men and women, and all others in our community who came before us. Our school's eighth year of fundraising for Saint David's Kalina Primary School in Tigray, Ethiopia, kicked off last week with a Chapel given by Save the Children's Cheryl Anderson to our seventh and eighth graders. Saint David's partnered with Save the Children during our sixtieth anniversary year to build an elementary school for the boys and girls in Kalina, who at the time had only limited open air dass education available to them. The project was initiated as an apt way for our elementary school to give back, and act in service of the greater good through a long term commitment to the education of the children of Kalina. Through each successive year of fundraising, led by the eighth graders and their teacher Tom Ryan, our boys have spearheaded projects and raised funds that have resulted in the construction of a complete K through Grade 8 elementary school, an early childhood and development center, separate latrines for boys and girls, and a water point with in-school drinking and hand-washing facilities--vital in this drought prone area. Ms. Anderson spoke to our boys of the importance of their work, noting how 802 students are now able to attend the school. She also shared the experiences of two of the students, a boy and girl, both now in the eighth grade at Kalina; and how the school has given them a chance for a better future. The boys left Chapel excited to continue their commitment to our Dollars for Ethiopian Scholars project, and to raise money this year for additional resources and improved facilities for the school's older children. 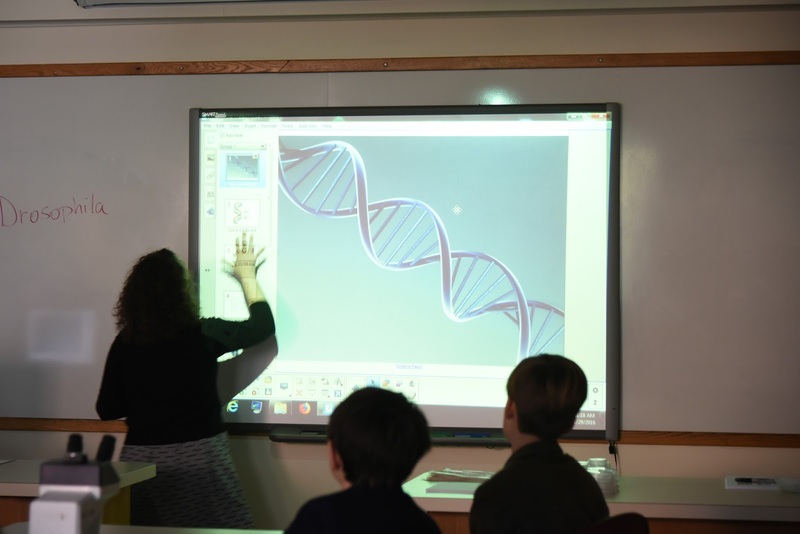 In conjunction with their study of DNA and genetics, last week our fifth graders and their teachers spent the day at the Cold Spring Harbor DNA Learning Center. 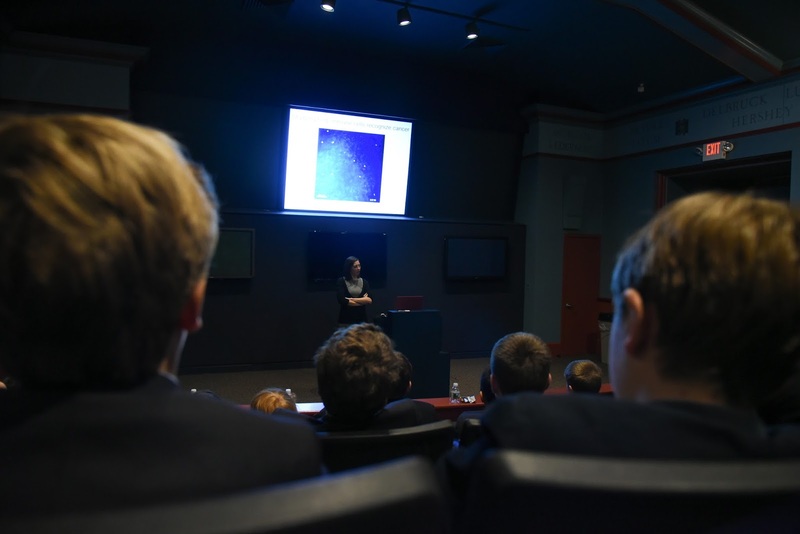 While there, they had the opportunity to meet with a DNALC scientist who spoke about current work being done in genetic research to find cures for diseases such as cancer. The boys also observed mutant organisms under the microscope, and made forensic observations and inferences about "Ötzi the Iceman" -- the oldest natural mummy from the Copper Age of a European man. Saint David's is in the fifth year of a partnership with the DNA Learning Center —the world’s first science center devoted entirely to genetics education. 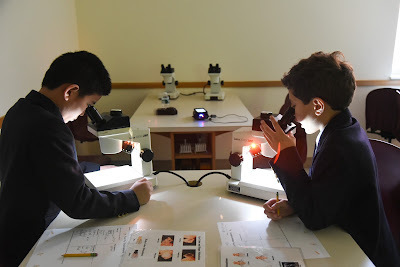 Exciting, real world application, out-of-classroom units like this one demand that our boys think and analyze critically, engaging their scientific minds, curiosity, and imagination. Arts is a pillar of our school's program. Our boys learn to appreciate beauty in its many forms and to critically determine aesthetic value. 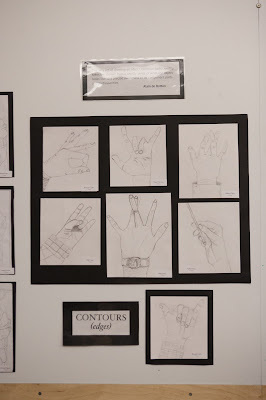 This starts in the youngest grades, and is widely evident throughout our art program. 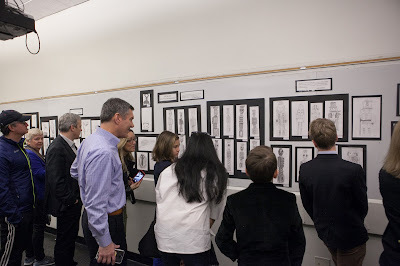 The Lower School Winter Art Show is currently showcasing our young boys' creative work in fine art, pottery, and wood shop. Their works are often related to studies in other subjects; third graders create covered wagons while they are learning about westward expansion, and Kindergartners make penguins in pottery after learning about them in class. Guided by their talented teachers Ms. Boccella, Ms. Fidler, Ms. Frassinelli, Ms. Mendez, and Mr. Kessler, the boys learn the tools, techniques and theory of art, are inspired by masters like Miro, Klee and Matisse, and encouraged to be creative and keen observers of the world around them.